Most modern languages contain anywhere from 25,000 – 35,000 actively used words. What I mean by “modern” is any language that is spoken by a relatively large community of a million people or more. What I say “actively used words”, I mean words that are actually used by everyday people on a regular basis. (For example, many modern English dictionaries include the words “thee” and “thou”, but these are no longer “actively used words”. At the same time, regardless of the language in question, most people rarely encounter more than 2,500 – 3,500 words on a daily basis. Think about your own day; from the time you woke up, went to work, grabbed lunch, spoke to friends and colleagues, watched some television, listened to some radio, etc… I’ll bet that you didn’t come into contact with or use more than 2,500 – 3,500 words. Don’t believe me? Let’s break it down… There are 24 hours in a day, and most people sleep for 8. Of the remaining 16 hours, there are clearly “quiet times”. You might be showering, walking in silence, etc… but let’s forget those times. Also, let’s go with the lower end of the range and stick with 2,500 words. Out of the 16 hours you’re awake, if you heard or used 2,500 words, you’d come into contact with 156 unique words per hour, or 2 – 3 unique words per minute. That number is probably starting to sound a lot more realistic now. B: Hey, I am fine. B: I went to the store. A: I am going there tomorrow. But let me introduce you to the concept of a “word vector”. Word vectors represent the idea that stands behind the word. For example, “hi” and “hey” are really the same word vector. You don’t need to know both words in order to have a meaningful conversation. there are six unique words there that all reflect one word vector – the concept of going, albeit with different tenses. Look, I know the original dialogue was pretty artificial, and the one above is not grammatically correct, but if you were in a foreign country, and this was the best you could speak, you would still be fully understood by a native speaker from that country. The original dialogue had 22 words, 18 of which were unique. In the simplified dialogue, however, there are only 9 word vectors. That allows us to use 50% fewer words and still get our point across. So if a fluent speaker of a language typically only uses an average of 2,500 words per day, those words probably only cover around 1,250 word vectors. Later in this document, I’ll cut that 1,250 figure in half again and show you the ~600 words (and ~150 phrases) you need to learn in order to survive speaking a foreign language. That’s a huge simplification (and a lot less work) than learning 25,000 – 35,000 words! So if you want to know the best way to learn French, the key is to focus on core vocabulary and key phrases. So what are those magical pieces of knowledge you should master? Unfortunately, I can’t tell you. The reason is that there is not set list… it’s going to depend on why you’re learning French. The best way to learn French for you is going to depend on your personal goals and circumstances. One of the fastest ways to learn French is to pick up a few verbs that you can use in a variety of settings. I’d also say that this is one of the easiest ways to learn French. Why? Common verbs will almost force you to practice. The verbs in my list above are very common, and you’ll probably end up using them many times during the day. Why are you eating this? I want to know how that smells. Do you know why she wants that? That last one is a pretty complicated sentence, actually, but simple with the approach above. 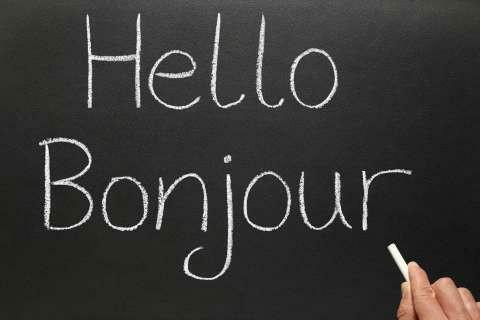 The French language is also one of the most widely spoken on the planet; world-wide, there are an estimated 220 million speakers of French, and is the 4th most widely spoken language within the European Union. The role of the French language in the modern world finds its root in colonialism. Many of the non-European regions where French is spoken today were former French colonies, and the global status of the French language is part of why French is one of the four official languages of the United Nations.